I've been looking for stories about fascinating women doing interesting things where the love relationship wasn't the only thing going on. This definitely filled that bill. The Baltimore Sun says it is "Her most gloriously lyrical and harshly beautiful book." It is definitely both. This may not have been my favorite book but I knew from the beginning that I was in the hands of a master story teller and a verbal artist. "Ravens are the birds I'll miss most when I die. ... If only we did not have to die at all. Instead become ravens. I've watched these birds so hard I feel their black feathers split out of my skin." I was fascinated by Faye's life as an estate appraiser. The idea of sorting through the detritus of a life is probably not as glamorous as it sounds, but it sounds like a treasure hunt. Faye sounds weary, though, as she says, "All I have is other people's lives." When she takes an action that is very unlike her normal self, she states, "I have stepped out of rules and laws and am breathing thin, new air." I think all of us have that yearning, once in awhile, to breathe thin, new air. I had difficulty connecting with Faye's life although I recognized her statement about her complicated relationship with a professor when she states, "I am not inexperienced in love, I just haven't been successful at it ... "
"Today, my art is blackberry jam." "Brush jewelweed and its seeds pop six feet." "The mind is a wolf." "The knowledge was there, in the tiny black eyes sharp as bitter stars. The Washington Post Book World reviewer Donna Rifkind makes a comment that I think captures the flavor of this book: "Her (Erdrich) fictionalized version of the real Ojibwe tribe is a brilliant creation: it possess the instantly persuasive strangeness of something faithful to life." Amazon writeup: When a woman named Faye Travers is called upon to appraise the estate of a family in her small New Hampshire town, she isn't surprised to discover a forgotten cache of valuable Native American artifacts. After all, the family descends from an Indian agent who worked on the North Dakota Ojibwe reservation that is home to her mother's family. However, she stops dead in her tracks when she finds in the collection a rare drum—a powerful yet delicate object, made from a massive moose skin stretched across a hollow of cedar, ornamented with symbols she doesn't recognize and dressed in red tassels and a beaded belt and skirt—especially since, without touching the instrument, she hears it sound. And so begins an illuminating journey both backward and forward in time, following the strange passage of a powerful yet delicate instrument, and revealing the extraordinary lives it has touched and defined. 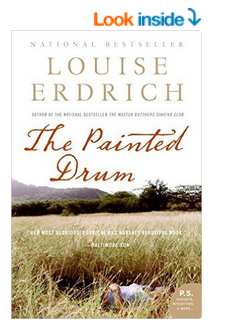 Compelling and unforgettable, bestselling author Louise Erdrich's Painted Drum explores the often fraught relationship between mothers and daughters, the strength of family, and the intricate rhythms of grief with all the grace, wit, and startling beauty that characterizes this acclaimed author's finest work. The novel starts in the present day and is very sluggish at first. Erdrich assumes too much and does not clearly place the reader in an understandable community -- at first. The same is true of the narrator's living situation. She is clearly a grown woman, living with her mother, carrying on a discreet affair with a neighboring sculptor. But why is it so discreet? This is never made clear. One is far into the book before beginning to understand why mother and daughter are together. Indeed, the answer to that question is central to the plot yet it is answered very abruptly, I thought. Nonetheless, once the drum is introduced, the writing and the story jump to a whole other level. The stories about the drum are truly magical, mesmerizing. I went from slogging through the first part of the book to not wanting to put it down. The creation of the drum and the way in which it is imbued with the spirit of a young girl are the heart of the book and beautifully written. I highly recommend this book, even though you may have to do some work at the beginning to get into it.